Making photographs indoors during the full light of day can present a variety of exposure challenges to real estate photographers in terms of dynamic range. From light spiking through windows to shadows lurking behind walls, the eye will adjust to balance these harsh conditions automatically. Our cameras in-turn rely on the photographer’s vision and decision-making to produce the necessary range of exposures required to cover the gamut and generate a realistic composition of the scene in post. Regardless of the style of shooting, wherever dynamic range presents a problem, HDRsoft is there with a well-stocked toolbox of creative solutions. 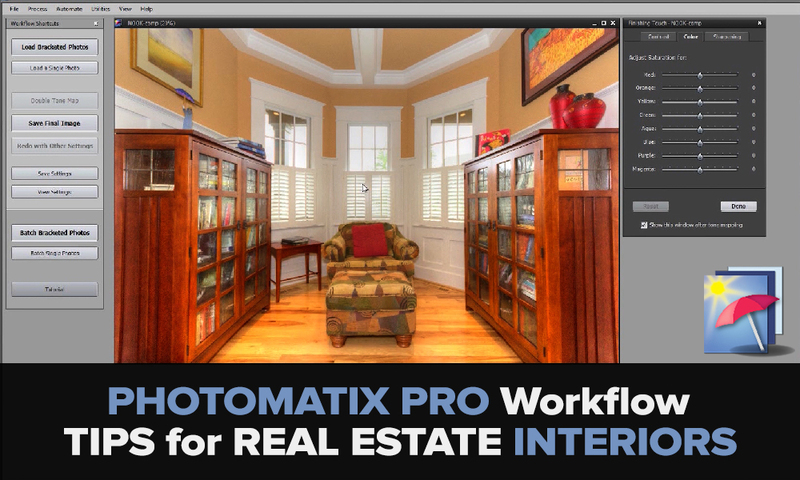 In this video, we’ll take some time to explore a few samples and useful tips to adding depth and speed to any real estate interiors workflow via the creative power of Photomatix Pro and Adobe Camera Raw. Recommended viewing at 1.25x speed. Thank you all for joining us for the last HDR Hangout, we always appreciate you being there and thank you for all the questions that came in, as well as those for future shows as well. If you missed last month’s hangout, HDRsoft insider and panoramic specialist Ron Pepper joined Photofocus’ Rich Harrington and myself to address a few common HDR questions and show what Photomatix Pro can do for any photographer’s workflow, especially for real estate and landscape shooters. As always, thanks for stopping by. I hope you’ll find the information useful. Please feel free to leave a question in the comments below, or drop a line to [email protected] and we’ll do our best to provide an answer in the next meeting. I have recently started doing a few Real Estate projects. I use the HDR features in LightRoom 6. What does Photomatix and it’s workflow offer that LR does not? There are absolutely no options for you to adjust the intensity of the HDR image. Even more surprising is the resulting new image has many siders pre-moved (including the highlight slider completely to the left), meaning there is little or no more recovery there. Thank you, Kent. Photomatix offers MUCH more creative power. LR HDR merely presents a starting point compared to the pixel control of Photomatix Pro. I recommend checking out the free trial to see the results first hand. Thanks for sharing this! It looks like the Photomatix is the real deal when comes down to enhancing HDR value of photographs. More than welcome, Mirchevphoto, thank you. It is indeed.. Glad you enjoyed.